There is just something so unbelievably magical about having confetti in your hair. Seriously, my favorite part of any confetti-throwing photo shoot is at the end of the day when all the colorful bits of happy are strewn throughout my locks, but who says it’s only supposed to be part of the aftermath of a bash? Why not purposely add it as part of your ensemble before the celebration starts? Whether you’re sporting a fun & festive look for prom, New Year’s, or your birthday, confetti hair is sure to be the talk of any party! An alternative look: two french-braid pigtails accented with sparkly hair tinsel. 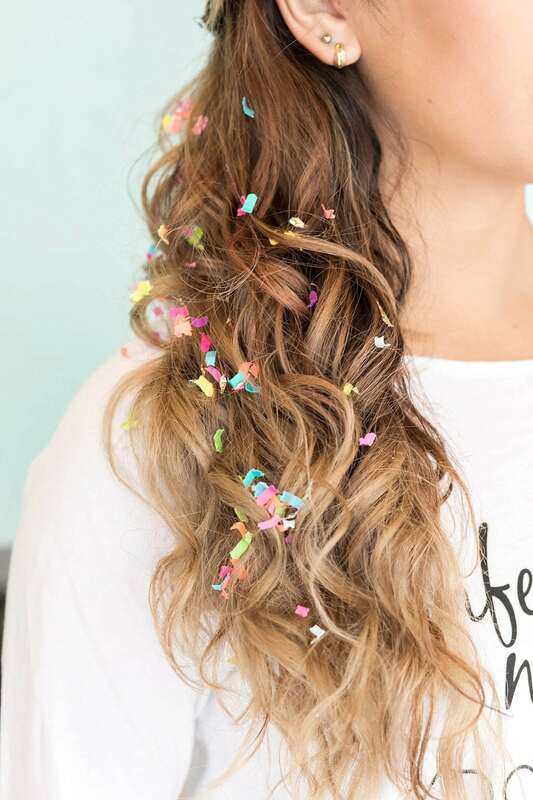 Tip: use some hair spray or hair gel to help the confetti “stick” to your hair. Voluminous curls + a side-swept braid + Unicorn Dandruff? Oh heck yeah!! A cascading braid makes for the perfect style to tuck cute little confetti shapes into. And if you want a super simple & easy to achieve look, just add a few curls to your ‘do, spritz with hairspray, and sprinkle on the confetti! Delicate Floralfetti™️ is a great choice to add a touch of romance to your outfit for a wedding or bridal shower. You can choose to go colorful or classic with your confetti choice, but either way it will surely indicate that you’re ready to par-tay. And while confetti hair is obviously perfect for any celebration you’ll be attending, it is equally fun would for things like branded business headshots (include your business name, logo, and/or hashtag in the confetti! ), senior portraits (include your year & school colors in the confetti! ), or even bridal photos (include things like wedding date, names, and/or “Mr+Mrs” in the confetti!) So many options, so little time.